A strictly limited edition of these crystal steins is produced exclusively by the King Werk beerstein factory. 1/2L content, 11.42 inches tall; diameter at the base: 4.33 inch. 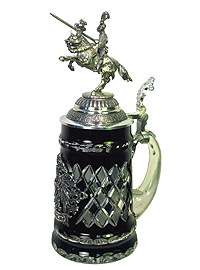 Large pewter knight figurine on top: the knight St. George. Pewter front plaque: Old German Eagle. Limited Edition of 999 pieces, certificate, pointed solid pewter top. The made in Germany sign visible on the second picture is only a sticker!